The recorded messages related to some of the most complained about nuisance calls including Payment Protection Insurance (PPI), Flight Delays and Packaged Bank Accounts. Some complainants said they were getting repeat calls, in some cases on the same day and more so despite following the instructions in the messages on how to opt out. This fine was part of a wider investigation into a complex network of companies which included an ICO raid on a call centre in south Manchester. 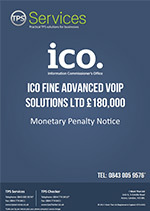 At the height of the automated call campaign, two telephony network providers claimed their services had been disrupted by the volume of calls being made by the business. The law on making automated calls playing recorded messages comes under the Privacy Electronic Communications Regulations (PECR) and is therefore stricter than on other ‘normal’ marketing calls. Organisations can only make automated marketing calls to people who have specifically consented to receiving them.